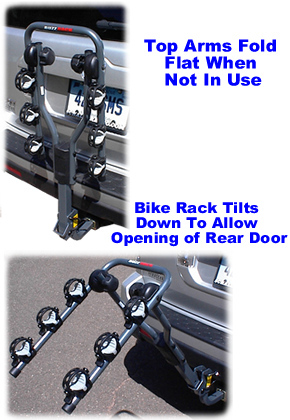 BuzzRack HR320 Antelope trailer hitch mounted fold down 3 bike racks and bicycle carriers. This model has been discontinued and is no longer available. - 3 Bicycle carrying capacity. scratch-free ride for your bikes. - Top bike arms fold down when not in use. - Heavy duty construction. Powder coated steel tubing. - Arrives mostly assembled, installs in minutes. Note: Included Adapter converts to fit both 1.25" and 2" hitches. The Buzz Rack Antelope 3 bike rack has all of the top of the line features you would find in bicycle carriers for three times the price. This hitch bicycle rack not only tilts down to allow access to the rear of the vehicle, but also features folding bike arms to make the bike rack more compact for storage or when empty behind the vehicle. A threaded hitch pin tightens the connection between the bike rack and your trailer hitch. Individual padded cradles protect your bike's finish and rotate to grab even the most unusual shaped bike frames.